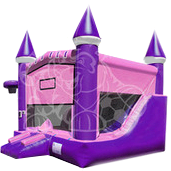 Sacramento Party Jumps has Mid-Sized Combo Bouncers to accommodate any party size! 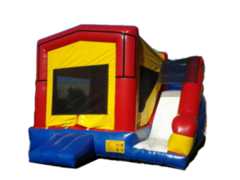 We offer different sized combos for bouncers of all ages, size, and abilities. 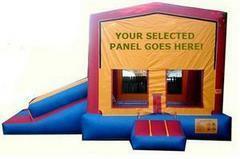 Our Mid Sized Combo Bouncers are geared towards kids and adults who want a little more then jumping and bouncing. 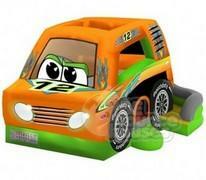 Our Race Car Combo gives your guests a jump area as well as a slide! Parents will love the high ceilings and safe exit area. Our 6 in 1 combo is great for jumpers and climbers. It also includes some fun pop-up obstacles inside to add more challenge for the more advanced jumper. This combo bouncer has a slide and a place to attach a banner to customize your Bouncer. Planning a BIG event? 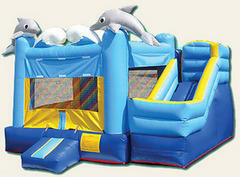 Let Sacramento Party Jumps take care of the details for you. We offer Tables, Chairs, and Tents to make your party more comfortable. Check out our kids chairs for the little ones. Protect your guests from the sun, wind, or light rain with our 10x10 tents. Click here to see our selection. 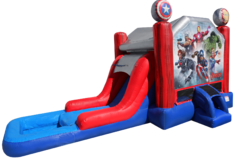 Marvel Avengers Bounce House Combo with Slide-Just In! 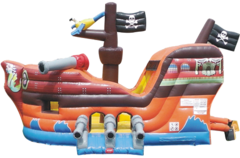 Pirate Ship Combo - New!